Happy New Year everyone! These two episodes unite the Fraser Family. 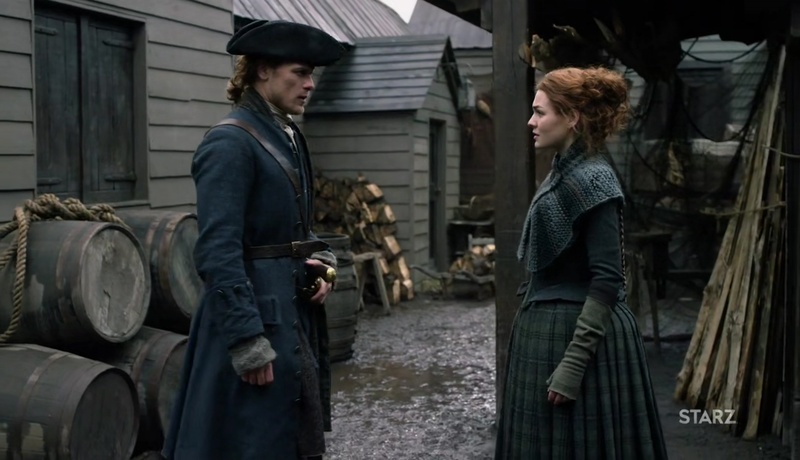 Jamie gets to meet the daughter he surrendered to the future so many years ago. We got a bit of the action adventure aspect of the show back this in Wilmington. Claire and Jamie are invited to the ‘theee-a- taa’ by the governor. It took me a minute to figure out whether the audience was heckling or enjoying the play. Apparently the art of talking to the screen has a long history. In this case the crowd was so loud the actors actually answered their questions and corrected inaccurate assumptions about the script. According to the writers their research indicated this was normal. By the time the evening was over the performance turned out to be the social event of the season. 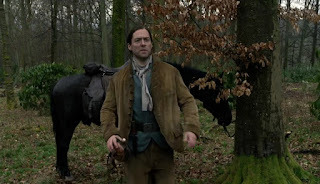 Jamie finds out that there’s a spy in Murtagh’s regulator ranks and that Murtagh is about to walk into a trap. 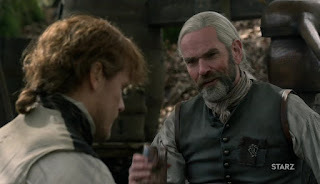 Jamie’s subtle way of creating a distraction, so he can warn Murtagh, is to punch the governor’s friend, Redman Fanning, in the stomach forcing his inguinal hernia into a critical stage. Claire ensures Governor Tryon never realizes that Jamie slipped out of the theatre by performing emergency surgery in the lobby of the theatre. Everyone in that room was watching Claire. Wilmington will be talking about this for years! Jamie sends Fergus to warn Murtagh. Fergus warns Murtagh in time. Murtagh’s a little annoyed that Jamie didn’t come himself but, once he realizes the man standing before him is Fergus, he’s happy to see him. 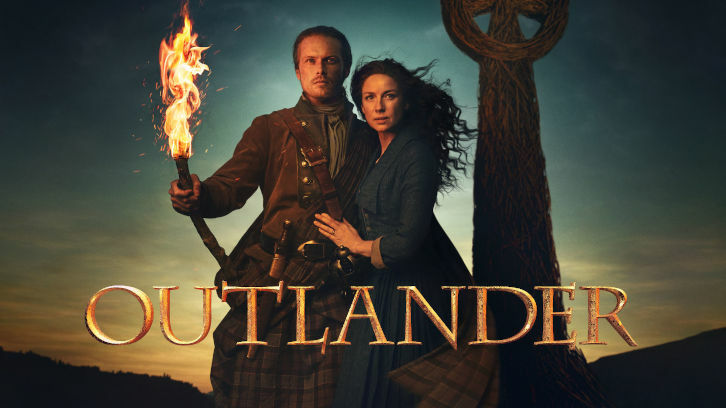 For anyone who hasn’t yet accepted the fact that Outlander is a soap opera, Roger and Brianna's story played out like a good old-fashioned daytime soap opera. I know a lot of people may assume that’s a condemnation but, I’m not one of them. I love soaps. Luckily, one of my favorite daytime soaps is still on the air. When Roger happens across Brianna in a tavern he’s surprised that she wasn’t sure where they stood. Either I’m old, he’s stupid or both. The last thing the man said to Brianna was that if she wasn’t ready to get engaged right then and there he wanted nothing to do with her. Did no one, during his teen years talk to him about deal with women? Brianna not only lets him off the hook (IMHO he still owes her an apology for that confrontation), but decides to take him up on his offer. When he suggests that, rather than simply getting engaged, they get handfast. She agrees. The ceremony and wedding night were sweet. Everything between them was perfect, until Brianna discovered that Roger kept the information about the death notice from her. Brianna blew a fuse. So Roger, being, well I have to stick with stupid, decided the best move was to suggest that now they’re married she should just do what he says. Even better he tells her she’s being childish (neither of them are exhibiting massive amounts of maturity here). When he threatens to return to the 20th Century Brianna refused to stop him. He storms out. She returns to the tavern alone. At the tavern she sees Stephen Bonnet about to bet with her mother’s wedding ring. Brianna offers to buy it off of him, but when she steps into an adjacent room to discuss price, she finds out that the price is her. Bonnet rapes Brianna while a room full of men, Bonnet’s friends, ignore her cries for help. I could accept the men in the tavern ignoring what was happening to Brianna. These weren’t family men. They were Bonnet’s buddies. It’s the 17th Century. And let’s face it, not too long ago the American justice system would allow a defense attorney to blame the victim for being raped. What I couldn’t believe was the absolute lack of concern (or reaction of any kind) from the women in the room. I can believe that they would find it commonplace but not even a little sympathy? When Lizzy tried to help Brianna, Brianna shut her down. Roger and Brianna were both willing to kiss and make up the next morning. Unfortunately, Bonnet forced Roger to finish his employment contract so Brianna thinks he returned to Scotland and the 20th Century. Lizzy was able to brighten Brianna’s day by telling her that Jamie and Claire Fraser were in Wilmington at that moment. Finally the family is together. I kind of like that Brianna didn’t waste any time showing her parents the obituary. Although I did laugh at Jamie’s professional indignation over the smudge that obscured the date. The family heads for Fraser’s Ridge. Jamie was adorable. Claire was right. He and Brianna are walking on eggshells; trying to get to know each other without hurting each other’s feelings. Claire suggests he take her with him on a hunting trip. The trip works. Brianna and Jamie have a chance to talk. Brianna admits to feeling disloyal to Frank. Jamie lets her know what he thinks about Frank. I think he makes it okay for Brianna to keep Frank in her heart. Brianna finally admits she doesn’t know what to call Jamie. He suggests she call him Da. When Lizzy identified Roger as the man to raped Brianna, I realized…classic soap opera complications pepper this entire story. Brianna is raped just after consummating her marriage so she doesn’t know who is the father of her baby. She has no idea that Roger is still in America, let alone coming to find her (hopefully to apologize). And she didn’t tell Jamie the name of the man who raped her because she didn’t want him to feel any more guilty than he already did over Bonnet. Brianna never spoke to Lizzy to explain Roger was the man she saw Brianna with and that he was NOT the man who raped her. All of these misunderstandings, miscommunications and omissions led to Roger getting the daylights kicked out of him by an angry protective father. Overall, I enjoyed the two episodes. For me the highlights were the emergency surgery and the montage of Brianna spending time with her family. I liked seeing Murtagh sitting at the family table laughing and telling stories about Jamie’s childhood. What were your episode highlights? What didn’t work for you? Share in the comment section below.